Planning permission has been granted for our extensive refurbishment proposals for Wildern Leisure Centre in Hedge End, part of Eastleigh Borough. Currently, the roof of the 40-year old main swimming pool is now close to the end of its predicted life span. Eastleigh Borough Council, in partnership with the Wildern Academy Trust, seized the opportunity to improve this popular community swimming pool, upgrading the facility to current standards and installing new spectator seating. Work will also be carried out to enhance both the external and internal appearance of the building, in part created by the addition of coloured translucent panels to filter light and block direct views from outside the building. 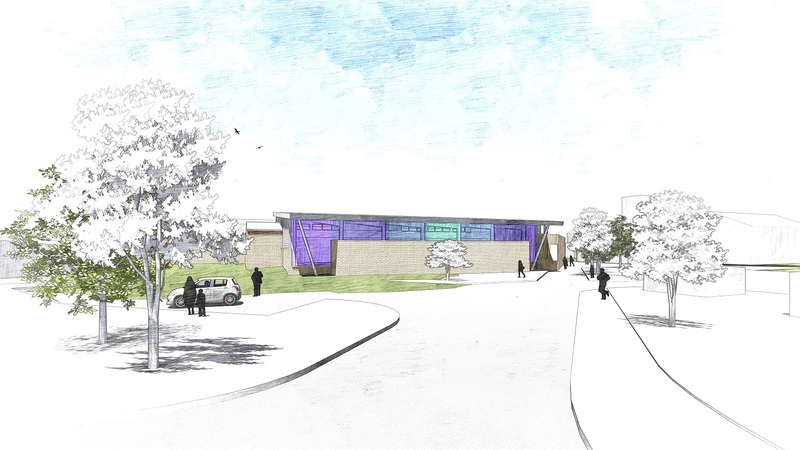 rhp's design for the new pool enclosure will create a sense of arrival and identity for the Wildern Leisure Centre, improving the swimming experience for pool users, and ensure another 40+ years of life for this valuable community asset. The planning application was approved by Hedge End, West End & Botley Local Area Committee.